To participate in Anza Athletics, AN ANNUAL SPORTS PHYSICAL MUST BE ON FILE in the school nurse’s office. Sports physicals expire at the end of each school year and must be renewed yearly. Athletes are ineligible to participate without a sports physical on file. Sports Forms: Please complete all forms and return to Anza Trail Nurse’s office. For more information on physicals, please contact our school nurse, Ms. Ledesma at ext. 1742. There is a participation fee of $25 per sport season, per athlete. We only accept cash or money order for athletics fees, no checks. These fees help provide equipment for sports teams, pay game officials, and provide transportation to and from contests. Scholarships are available if a student cannot afford the fee. Please submit a letter requesting a scholarship to an administrator. Students are issued a uniform free of charge and are expected to return the uniform in good condition. If the uniform is not returned, damaged, or lost, the student will be charged for replacement of the uniform. The student will also lose the privilege of fun activities or field trips until uniform is returned or paid for. Students are expected to adhere to all student conduct policies, including bus rules while participating in athletics. Eligibility sheets will be issued to each participating student and will be turned in to coaches every two weeks. There must be no D’s or F’s in order for the student to play. Please contact the Athletic Director, Mary Dailey at 520-625-3502 ext. 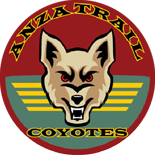 1735, with any questions regarding Anza Trail Athletics.